Discussions about iPhone 6 have not stopped in various medias, forums and social networks for the past months. The newly released iPhone 6 and iPhone 6 Plus have thinner bezel, larger screen size compared with iPhone 5S, coming with rounded edges and an opening for Touch ID, iSight camera and Apple Pay. Running on iOS 8, iPhone 6 is absolutely smart. 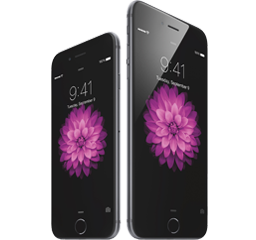 Despite all that, many guys yield to the temptation of advantages of jailbreak and want to jailbreak iPhone 6. If you're looking for guide to jailbreak iPhone 6, you get the right place. This article will leak iPhone 6 (Plus) jailbreak process which can also be applied to jailbreak iPhone 6s/Plus and iPhone SE, advantages of jailbreak and some must-have programs for iPhone 6/6s (Plus) and iPhone SE. How to Rip DVD to iPhone 6/6s (Plus)/SE? WinX DVD Ripper Platinum - Rip any DVD to iPhone 6/6s (Plus)/SE/7 playable formats for DVD video playback on iPhone anytime anywhere. Jailbreaking is the process of breaking restrictions on device. Apple iOS users have far less privilege than Android users. They are not allowed to change some iOS file system and download additional applications, themes and extensions unavailable in App Store. Such limitations really bring big inconvenience to iOS users. So, they have to jailbreak iPhone, iPad, iPod touch to escalate privilege and enjoy the following benefits. Use unauthorized apps. There're more than one million apps in App Store, but people still long for those programs rejected by App Store for one reason or another. If you want to get them downloaded and installed on your iOS 8-based iPhone 6 or iPhone 6 Plus, you should jailbreak iPhone 6 and get them through Cydia. Enhance Siri. Siri is good, but not perfect enough. After jailbreaking, however, Siri can carry out more commands. Change default apps. iOS users are not allowed to change default apps for certain tasks. But jailbreaking gives you the freedom to set iPhone. For example, you can use Chrome instead of Safari. 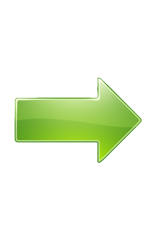 You can use third-party input method software. How to Jailbreak iPhone 6 (Plus)/6s (Plus)/iPhone SE? In case something goes wrong when jailbreaking iPhone 6 (Plus)/6S (Plus)/iPhone SE/7(Plus), you're highly recommended to make a current backup of your iPhone using iTunes, iCloud or WinX MediaTrans and disable your passcode on iPhone before jailbreak process. And then move forward to the steps below. Step 1. Choose a jailbreak tool for iPhone 6/6s/iPhone SE and download it on computer. A reliable iPhone 6/6s/SE jailbreak tool should be user-friendly, effective, and safe, and have a dedicated user base. Furthermore, you're suggested to use a notebook which has been fully charged in case an unexpected outage breaks the process of jailbreak. Step 2. Shut down iTunes, Xcode and other iOS device management connection applications. If you keep these apps running, your iPhone 6/6s/SE jailbreak will be interfered anytime. It is advisable to stop any operations on your iPhone 6/6s/SE and computer. Step 3. Connect iPhone 6/6s/SE with computer via USB cable and run the jailbreak tool as instructed. Before any further, you are supposed to wait until your computer has detected the iPhone 6/6s/SE. And then all you need to do is open and run the iPhone jailbreak program as required. Jailbreak is very easy to handle. Take evasi0n as an example, you can finish iPhone/iOS jailbreak in a few simple steps in roughly 10 minutes. There're many must-have best apps for iPhone, like Dropbox, EasilyDo, Google Maps. This part will mainly focus on DVD/video converter for iPhone 6/6s (Plus)/SE/7/8/X, because the demand for playing DVDs/videos on iPhone increases. But can you directly play DVD movie on iPhone 6/6s/SE/7/8/X? If your videos are not compatible with iPhone 6/6s, how to convert to iPhone 6/6s supported video formats? The following two applications will give the best solutions to rip DVD to iPhone 6/6s/SE/7/8/X and convert videos to iPhone 6/6s/SE/7/8/X. 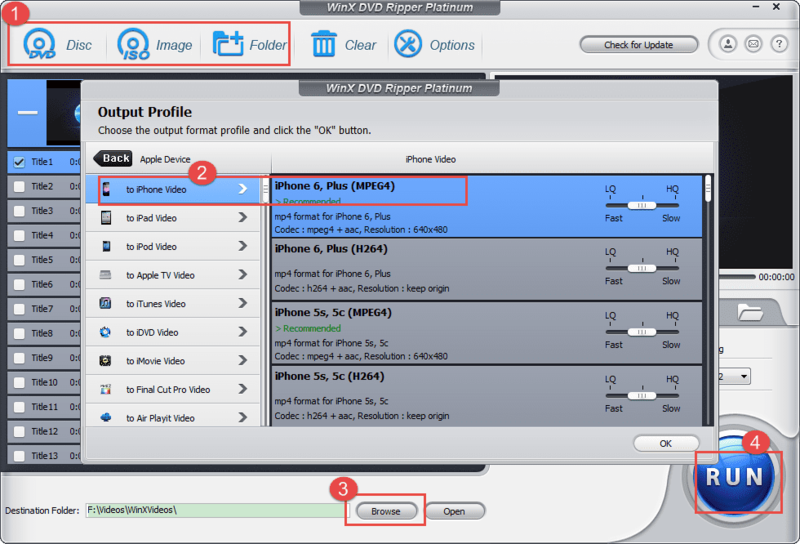 WinX DVD Ripper Platinum (or Mac version) is a full-featured DVD ripper program which excels in ripping any DVD to iPhone (including the new iPhone SE), iPod Touch, iPad, Apple TV, Android, Microsoft, Sony, Chromecast and other prevailing devices. Latest commercial DVD copy protections are very strong, but this DVD ripper can easily access to DVD and rip DVD to common media formats like MP4, MOV, M4V, MKV, MPEG, AVI, WMV, etc. Thanks to High Quality Engine and support for Multi-core CPU and Hyper-threading, it delivers a copy of DVD for iPhone 6/6s/SE/7/8/X with original audio video quality at ultra fast ripping speed. No matter you jailbreak iPhone 6/6s/SE/7 or not, it is the best and easiest solution to rip DVD for iPhone 6/6s/SE/7/8/X. iPhones only support M4V, MP4, MOV, and M-JPEG. So if you want to play other videos in AVI, WMV, MKV, AVCHD, TS and others, you need a powerful video converter, like WinX HD Video Converter Deluxe. Built in all mainstream video formats, it can convert high definition videos MKV, M2TS, AVCHD, MOD, HD camcorder videos and Blu-ray videos, and standard definition videos MP4, M4V, MOV, MPEG, FLV, WebM, etc. Because of optimal device profiles, users can directly convert SD & HD videos to iPhone 6/6s, iPhone 5S, iPad, iPod, Samsung Galaxy, Google New Nexus, HTC, WP8, Xbox, PSP, etc. The iPhone SE profile will come out soon. Moreover, it also allows you to download and convert YouTube videos to play on iPhone 6/6s/SE/7/8/X and make graduation slideshow or other photo slideshow for later playback on iPhone 6/6s/SE/7/8/X. Using this video converter, you can play any videos on jailbroken or unjailbroken iPhone 6/6s/SE/7/8/X. 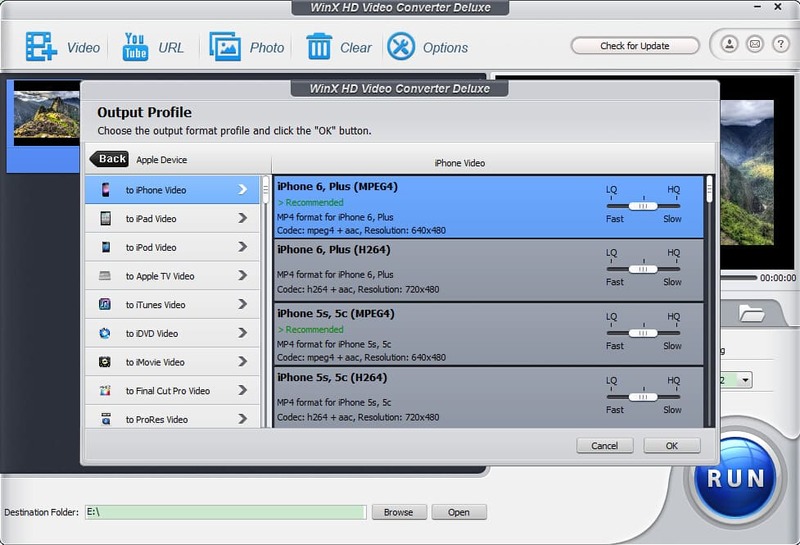 If you want to convert videos to iPhone, iPad, iPod, Apple TV, Android, Google, Microsoft and more, WinX HD Video Converter Deluxe is the way to go.